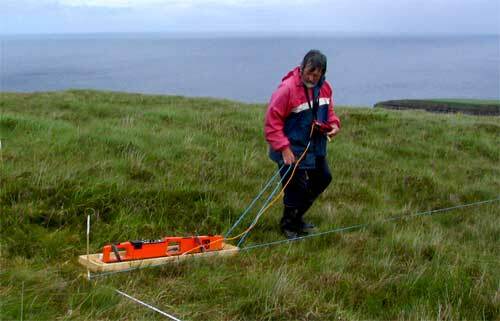 Environmental surveys allow the assessment of a wide range of activities which may impact on the landscape. These impacts include pollution, contamination and other human impacts within a variety of terrains from peatland, to farmland to urban areas. Through a wide range of techniques and methodologies we can assist in environmental assessment and monitoring for example where a product spillage has occurred or in the development of water management schemes. Our experience enables us to deploy a range of geophysical techniques which allow assessment of the sub-soil, sediments and bedrock, important when assessing the nature and effect of a product spillage. Assessment of the bedrock and overlying sediments can also enable the targeting of augered and cored boreholes and the design of a network of relief wells. Continuous depth information can be obtained enabling the mapping of potential pollution pathways or an irregular bedrock surface. This is achieved using Electrical Resistivity Tomography (ERT) which provides a continuous resistivity section to depths of up to 20m.